A car is mangled after a fatal accident on Interstate 880 (September 4, 2016). The identity of the boy killed in a collision on Interstate 880 in Hayward early Sunday morning was released by the Alameda County coroner's bureau. Izaiah Mease, 17, was pronounced dead at the scene. He was a Union City resident and was the driver of the car. 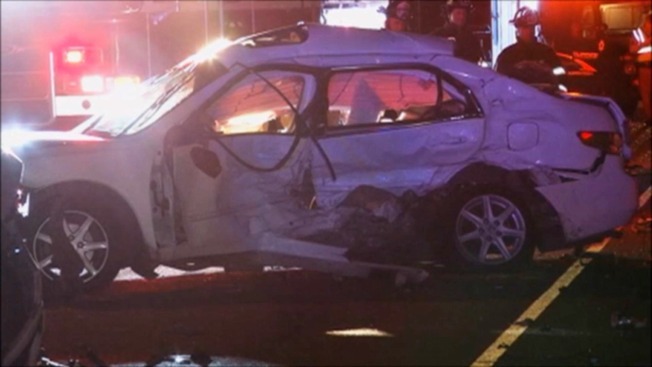 Officials at the coroner's bureau said there were two passengers in the car. The two-vehicle collision was reported on southbound 880 near the West A Street on-ramp at about 1:25 a.m. All lanes were reopened at 4:46 a.m.
Four other parties were transported to local hospitals to be treated for injuries that ranged from minor to major, according to the CHP.